Material is very nice and I love the color. Exactly as pictured. I have not had a chance to assemble yet as my house in still under construction. Will update on that at a later date. Update: We finally got moved into our house & have been using this bed for 6 months.. we love it! It is so nice especially if you like to sit up in bed as the head board is basically a pillow. Would definitely recommend. Compliment your favorite bedspread with the Nellie upholstered bed. Framed with sturdy birch and upholstered in calming grey, this classic bed frame features diamond tufting on the headboard for a welcoming and cozy design. This bed frame is beyond my expectations! I made this purchase and was skeptical because I own a Sleep Number adjustable bed and from the picture this is a low profile bed, lower than the one I originally had, and I wasn't sure it would work. Once we removed the leg extensions on the adjustable bed, it fit like a glove. It is absolutely stunning! The material is high quality looking linen in grey and looks luxuriously expensive. The grey is a medium tone, not too dark and not too light. It is very sturdy and my husband was able to assemble and set it up by himself. 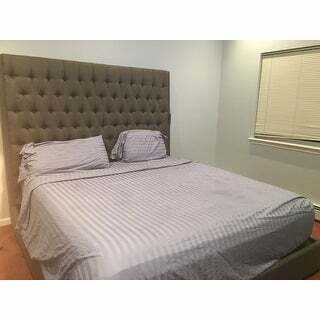 The headboard is very high as indicated in the description, 72 inches, it looks fantastic. I will post pictures after I complete the room. If you want a statement piece, this is it! This bed frame is perfect. We got the king size. We got a 14-inch king size mattress and we will need to buy a 5-inch boxspring since the mattress is sitting really low. Product came in 2 boxes, very heavy. Great bed. The bed comes with slats so theoretically you do not need a box spring. But the mattress sits very low without a box spring. I ordered a 5 in box spring to compensate. Another great buy! I purchased it in grey and it's grey as advertised. It's a statement bed! 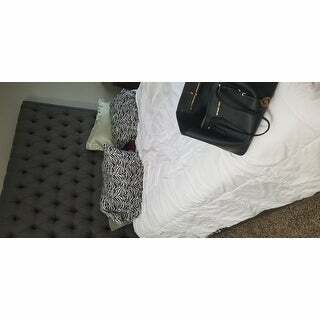 I overly love this bed! My Queen box spring and mattress fix perfectly in the frame. It's fairly easy to assemble. It may have taken an hour between unboxing it and assembling the bed. Buy it! You won't regret it! We are absolutely glad we ordered this bed. I comes in a 2 huge boxes so it may be a good idea to pay the extra money to have it delivered inside your house to the room assembly will occur unless you have help. This bed is a statement piece and looks stunning with the purple and grey bedding we got. My husband was able to put it together fairly easy with minimal help from my son. It does sit low to the ground so i would advise buying a thicker mattress and box spring to elevate it. I was a bit frustrated in the first place because when I called overstock, th representative told me my order was going to be delivered on 09/26, but apparently the delivery company didn't make it to my area and I ended receiving the product a week later. But I have to say receiving the product and assembling it makes all my frustration with overstock when away. Beautiful! Beautiful! Beautiful! I think this bed came out nice than I expected. It was easy to assemble and feels very firm. I will definitely recommend this bed to anyone. Received items as described and pictured. These days there are a lot of pictorial deceptions. This one is 100% on point. PLEASE NOT: You can actually use your king box spring and mattress; they all fit in this bed! Not snug but they fit. Good buy. I am a hard rater! Love this bed frame! Good quality and looks great! Got the bed and installed it in our bedroom, somehow the bed was not really what I expected. I was expecting a huge and elegant bed but after seeing it, I didn’t get the wow factor as I thought I would. It’s still a good bed overall. Our first time switch to California king size but it feel smaller than our old king bed. Love this bed. A little lighter than pic but it’s great quality. The bed took a little longer than originally estimated & quoted but overall that’s okay for me bc I cant put it together as of yet since my house isn’t completely built. I love the color of the bed. I paid the additional $9.99 for inside of garage delivery due to the size of the king size bed. Fingers crossed all is well when I finally open all boxes & get to putting everything together! Great quality and is much taller than I expected. Looks very regal..I have an accent window in my bed room shaped like a half moon and this bed falls flush right under it! This bed is beautiful. It was a pain to put together because there wasnt any directions and the holes dont align perfectly but, we did it. It takes 2 people that's for sure. But it has held up well and looks just as expensive as any bed from a designer store. absolutely stunning bed! Sleek, Sophisticated design! Classy and elegant! Easy to clean and maintain! Highly recommend if you are going for a modern/classy look! This is a beautiful bed and makes the room feel like a high end hotel suite!! Very nice bed! We could not find some parts in the package and called Customer Service. Turned out everything was there in the zipped compartment in the back of the headboard. Took a couple of hours to put it together but it was relatively simple. Overall, great purchase and we received many compliments on the bed! I love this bed! great quality and looks just like the picture. It was fairly easy to assemble and fit perfectly in my room. i would highly recommend! 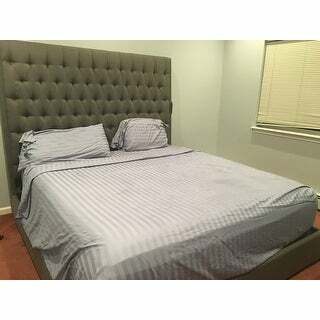 "Need interior dimensions to ensure my split king adjustable bed will fit inside of this bed WITHOUT a ton of room. I am assuming the dimensions listed are exterior, as a king would NOT warrant a 92" length. TIA"
" Does it come in dark brown"
"Can this bed be used with an adjustable bed?" Without knowing the size of the adjustable bed, we’d recommend using the headboard only option not the headboard/footboard with rail bed. "Do you need a box spring for this bed, or are there enough slats to support the mattress on its on?" "HOw many slats for king bed?" "What size queen matters will you use will you need a box spring ?" The bed frame is low but not that low. I am not using a box spring. I have an adjustable Sleep Number base and it is perfect!